Orwell Stronghold caters to a number of scientific disciplines and houses some of the most brilliant minds this side of the Horse-head Nebula. As a Waystation of Benevolent Dynamics, itself an independent technocracy, the station operates independently of Consortium or Gaule jurisdiction. Rather, its sole focus is the development of many of the technologies rediscovered by Benevolent Dynamics after the Catastrophe and distributed indiscriminately throughout all that remains of humanity. A number of upgrades, for example, to your CORETECHS were developed right here on Orwell Stronghold and we have made a number of strides in the behavioral understanding of androids and robots! To a layman, the station can, at first, seem rather daunting. Flocks of drones buzz overhead while behemothic glittering holo-screens create a dazzling display on many of the station’s walls. 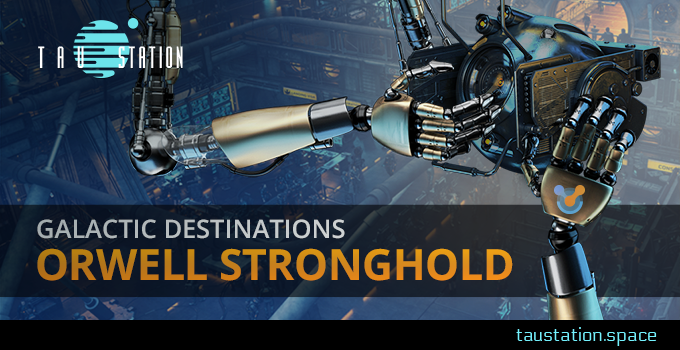 Robots and androids are in much larger abundance and even hold positions of responsibility on the station and many of the local areas brim with all manner of the latest technologies. One might, for example, relax in the Ida Lovelace Lounge where every available surface can be converted into a holo-workspace for that sudden brainstorm or equation that is catalyzed by an alcoholic beverage. Many workstations in the Employment Center, thanks to some of our external field contractors, now utilize Omni-Reality and allow users to log into a pocket virtual space where they can conduct their business in digital privacy. However long or brief your stay on Orwell Station, Benevolent Dynamics wishes you a continued and extraordinarily pleasant day! For our part, we will stay the course with our mission to bring the gift of science to everyone and use its knowledge to answer every mystery that bars our pathway to the stars and beyond.